This outstanding rocker was made from old growth black walnut from the Ruidoso NM area. 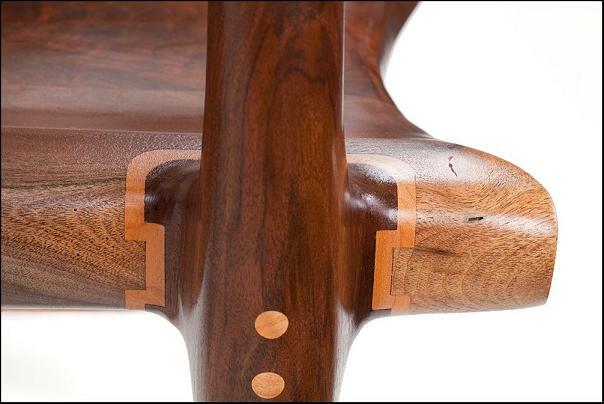 Curly cherry was used on the back lumbar support, inlayed into the runners and around the joints and used for plugs. A few changes were made to the design to improve the overall look and comfort, as can be seen by the front profile picture. We keep striving to improve the design of our rockers, not only for the comfort aspect but also to add more of our own artistic touches to a Sam Maloof inspired rocker design. We made the joints from the arms to the legs flow nicer and added a bow to the front for more roomy comfort. The inlay around the joints (see close up shot) is a time-consuming process, ensuring that everything fits right and that once handshaped together, they flow into one another seamlessly. This technique really shows off the joint area and adds a unique artistic touch to a rocker. The black walnut had incredible beauty with a little burling in areas. The contrast between the walnut and the curly cherry really makes this rocker stand out. Besides the incredible beauty of this heirloom piece, the comfort is outstanding, making you melt right into it and not want to leave. Our next project is a rocker made from African Purple Heart and cherry for a customer in CA. Can’t wait to see how this combination turns out. To see our other rockers or recent pieces we have created, please visit our website. 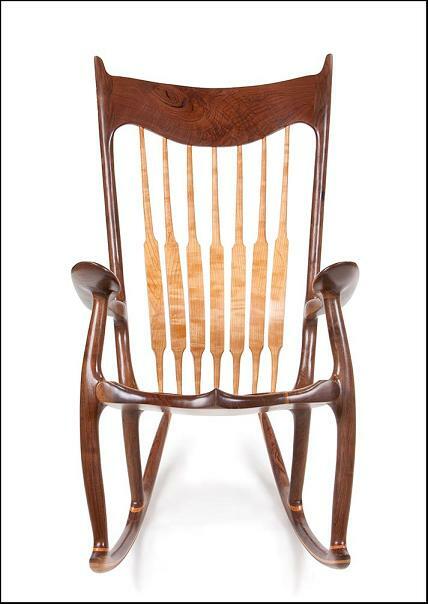 Like this rocker, Walnut with curly cherry, which looks like it would be very comfortable. This is probably an “old” blog and may no longer be available, but if not, would like dimensions, pricing and approx wait times for delivery. This is an old post. All our rockers are custom ordered to fit the individual. General dims on this style is 32″W x 36″D x approx. 52″ T. We take measurements from the individual and adjust from there. 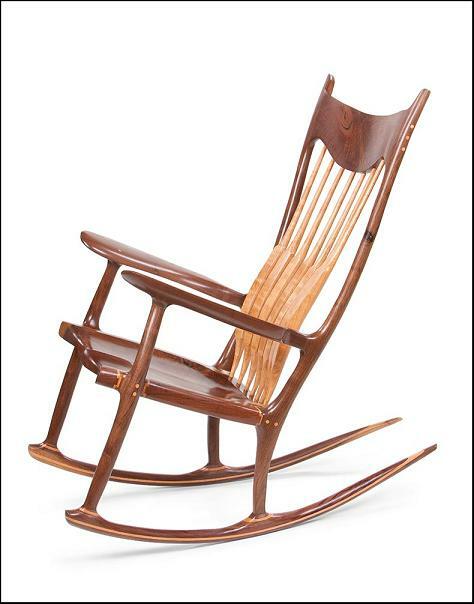 This style rocker with the wrapped joints and flexible back would be $4200.00. If you have any more questions please email or call. Thanks.